Hi everyone! Welcome back for another Clean & Simple Die Cutting episode. Today I’m working with large dies to create embossed backgrounds. This is the main card I’m sharing today. I also have one more project (you can see it below) and two more cards done using the same technique with some variations (mentioned during the video), I’ll share those in a few days as I haven’t photographed them yet. I started by masking stripes on a piece of white cardstock cut to 4 by 5 1/2 inches using washi tape. Mine was about 3/4″ wide so I ended up having 4 masked and 4 non masked areas. I than added a different color of ink to each of the stripes and created a fun background. 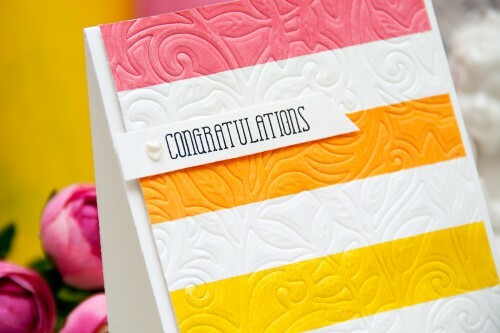 I used Spellbinders ink simply because I liked the colors, you can use whatever other inks you may have/like to use. After my inking was done I used a Grate Effect die from Spellbinders and embossed that piece in my Grand Calibur machine. You can also use embossing folder for this or even a smaller die (not a full card size one). 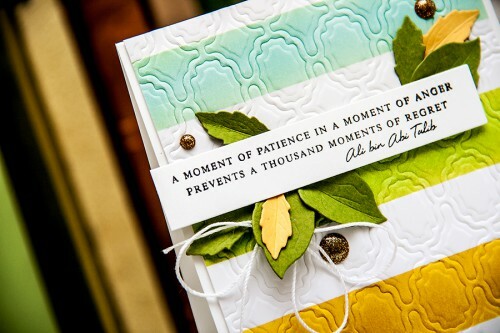 As for the sentiment I used a beautiful quote from Altenew – A moment of patience in a moment of anger prevents a thousand moments of regret and stamped it using Versafine Onyx Black ink. This is my most favorite ink for stamping sentiments. 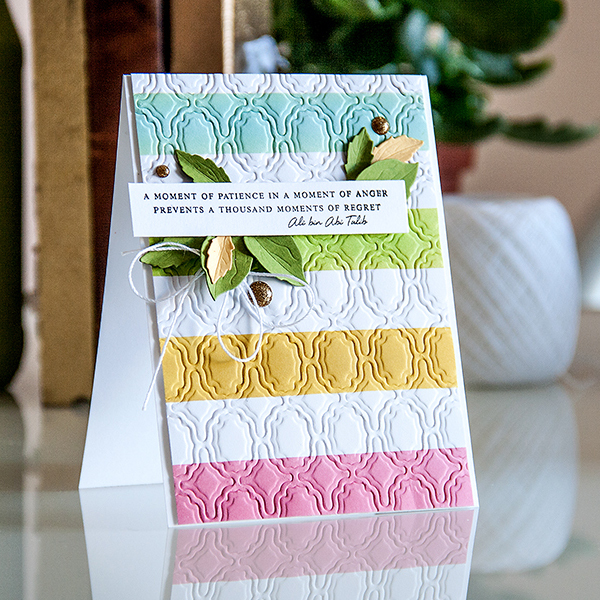 I also die cut several leaves using dies from two different Create a Flowers sets from Spellbinders. For some reason I almost never use leaves on my project, no idea why. 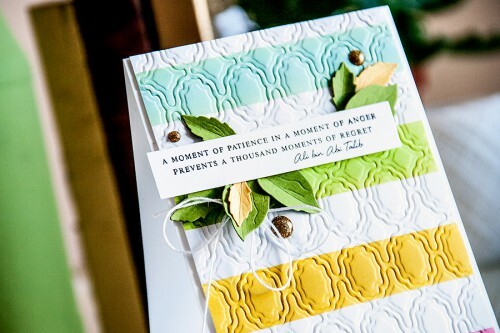 I cut those out of yellow and green cardstock and simply tucked them under the sentiment panel. 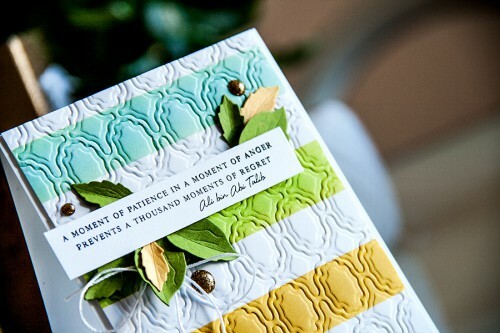 To finish this card I added several gold glitter enamel dots and a white twine bow. 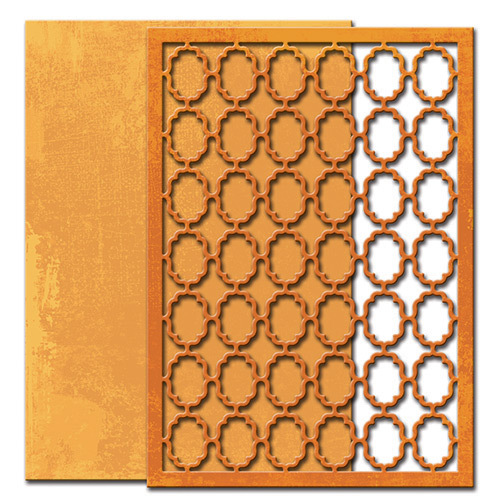 The color palette is almost identical, blue is substituted with orange on this card. 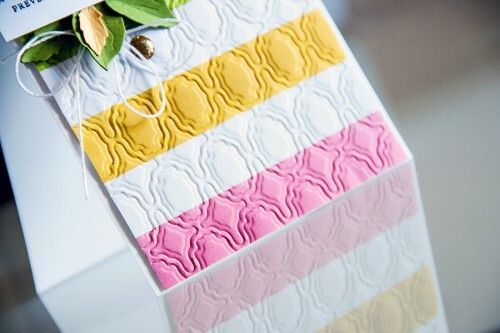 The embossing was done using a Botanical Swirls Spellbinders die (discontinued). 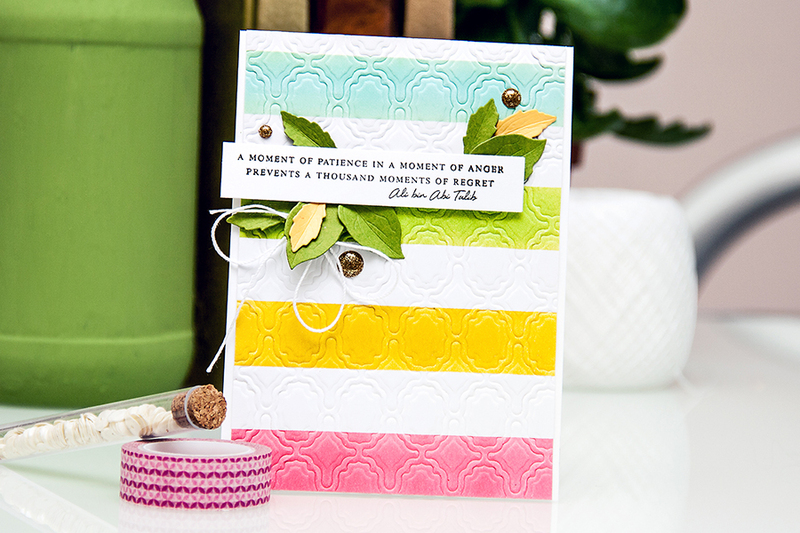 Sentiment is from Avery Elle’s Petals and Stems stamp set, its one of my most favorite ever! So tell me, which one do you like best? 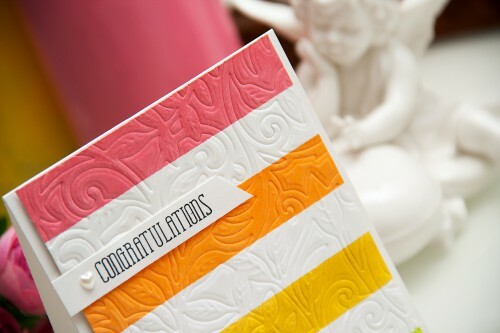 I like both of them, these inked and embossed stripes seem to have something magical to them! Both cards are beautiful, just perfect. The first card charmed the life out of me. I loved it so much. haha 🙂 you are hilarious 🙂 thank you! 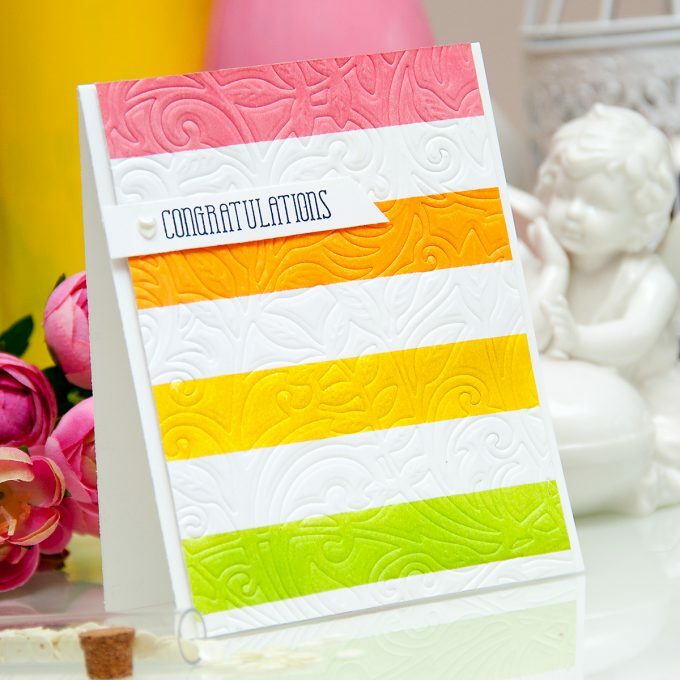 Stunning cards, Yana! I really love that Altenew quote.